The track and its accompanying clip follows the pair's 2018 hit Finesse (Remix). The orginal track featured on Mars' 2016 album '24K Magic'. Last month, Cardi B made history after scooping the Best Rap Album Grammy Award for her debut full length, 'Invasion of Privacy', making her the first solo female to do so. The rapper will headline Manchester's Parklife, Dublin's Longitude and London's Wireless Festival this summer. 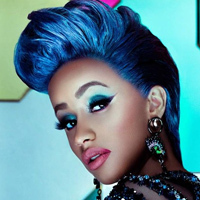 Click here to compare & buy Cardi B Tickets at Stereoboard.com.